Our clinic could not succeed without your help. Your commitment to making your treatments flow as smoothly as possible from the time you walk into the building until the time you leave is essential to making sure we are able to continue to offer services at the lowest rates for you and for our community. - Book your appointments online, if possible. Appointments can easily be booked through this website, through our facebook site and even by accessing our website on your smartphone. After your first visit, you will know your initial treatment plan and how many visits you will need per week and for how many weeks. Try to make all of your appointments ahead of time. This saves time at check in/check out but also makes sure you get the exact appointment time you need or want. -Have your payment ready when you come in. Payment is due at check in so having your check already made out or your cash ready will save time, particularly if our receptionist is working with another patient. -Arrive early. Appointment slots are narrow windows of time and even showing up 5 minutes late could mean we will have to reschedule you. Arriving about 10 minutes early is perfect. This will give you time to check in, use the restroom, grab a pillow or blanket and find and settle into your recliner. We love it when you are settled and comfy by your appointment time so that we can get right to work! -Take all of your belongings to your chair (and make sure all of your belongings leave with you!). Baskets are provided next to your chair for loose items such as keys, glasses or phones. Please hang your coat in the entryway in the reception area or fold it and leave it by your recliner. -If you are a new patient, please make sure you have brought all of the necessary forms with you to your appointment. If you do not fill them out ahead of time, please arrive at least 30 minutes prior to the start of your appointment time to do so. -Keeping a quiet, meditative and relaxing space is of the utmost importance. Please turn off your cell phone before coming into the treatment room. Always speak to your acupuncturist in a hushed voice. And, if you do choose to listen to your own music with headphones, please make sure you are the only one that can hear it! -Please make sure we always have your up-to-date contact information. Let the receptionist know when you check in if any of your information has changed since your last visit. -Follow your treatment plan to the best of your ability. We want this to work for you and staying the course with your treatment plan is the best path to success! -Lastly, take responsibility for your own health, be your own advocate and educate yourself. We will do our best to guide you to more information on your particular condition or on acupuncture in general. Most acupuncturists can talk for hours about health, wellness, and, of course, acupuncture! But, the community acupuncture setting allows for very little time for explanations of how acupuncture works or why a certain point is used. So, use our resources to find the information you need. You have the right to receive high-quality health care at prices you can afford and we strive to provide that for you. 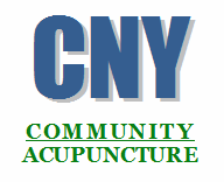 We hope you enjoy having CNY Community Acupuncture as a piece of your healing and wellness picture.